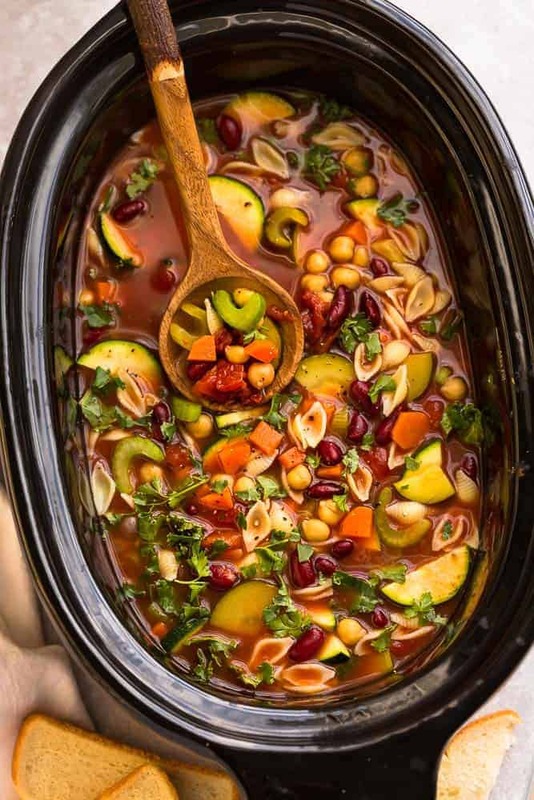 Slow Cooker Minestrone Soup is the perfect easy comforting homemade meal on a cold winter day. Best of all, this set and forget crock-pot recipe is simple to customize, hearty & full of fresh vegetables and beans. Now includes stovetop instructions plus recipe video! It’s a sure way to keep you warm and cozy which is perfect if you are feeling under the weather. Serve it with some crusty bread, a sprinkle of Parmesan and just grab a spoon! 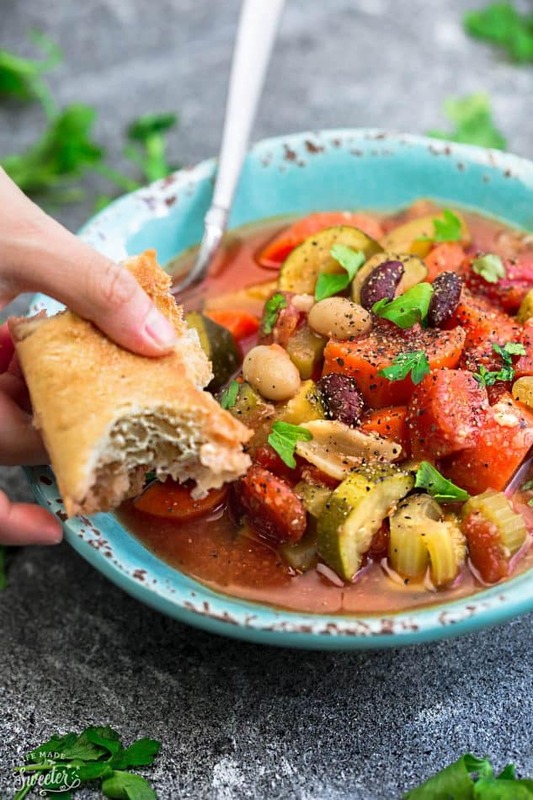 An easy slow cooker homemade minestrone soup so you can totally skip that stop to Olive Garden! Loaded with healthy vegetables like spinach and zucchini and protein packed with beans - so hearty and comforting! Easy to make gluten free. FOR THE SLOW COOKER VERSION:In a large 6 quart slow cooker, add carrots, celery, garlic, onions, basil, oregano, rosemary, thyme, diced tomatoes, tomato paste and bay leaves. Stir in vegetable broth and water (use less if you like it less watery) into slow cooker and season with salt and pepper to taste. Cover with lid and cook on low for 3-4 hours or high 1-2 hours. Season with more salt and pepper as needed and stir in balsamic vinegar (if using) and serve warm with bread and top with parmesan cheese and garnish with parsley if desired. ***NOTE about pasta - **If you plan to freeze this or serve the next day, leave out the pasta and cook on the side and then combine when you are ready to enjoy. This helps the pasta not get soggy. FOR THE STOVETOP VERSION In a large heavy bottomed pot or dutch oven, heat olive oil over medium heat. Add carrots, onion, celery, garlic, and onion and saute for about 4 minutes, or until vegetables are slightly softened. Add basil, oregano, rosemary, thyme and cook for an additional 1 minute. Add the tomato paste, bay leaves, vegetable broth, water, zucchini and both of the beans. Add pasta and spinach and cook for an additional 20 minutes or until pasta is tender or desired consistency is reached.